Uncomfortable about the appearance of her home and not having much time because of a job, a set of twins under three, and another child only a year older, M.E. called reSOLUTIONS. She wanted to feel better about her house before listing it with a realtor. From the lipstick on the carpet, crayon on the walls, there was a lot of confusion as to whom to call, what to do. M.E. did not even think about re-arranging the furniture or hanging mirrors and pictures differently. All she knew is that she wanted to feel better about her own home before she let anyone else thru her front door. When M.E. and her husband experienced what reSOLUTIONS could do for their home, M.E. 's husband said, "I don't think we have to move!" M.E. said, "I have always hated that couch. For 10 years I have looked at it and hated it. Since reSOLUTIONS re-arranged our living room, all I can say is 'I love the couch!" The same realtor came thru the house again, after reSOLUTIONS completed only three day's of work. 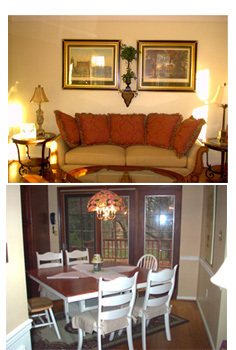 The appearance of the home improved dramatically because the furniture was now arranged, pictures grouped. There was a good traffic flow to the house. An additional $10,000 was asked for the house. Then came the bidding war that added $2,000 additional to the sale price, totaling a gain of $12,000 for only three days work. "Always keep brooms, mops and other cleaning equipment hidden away when not in use, as the presence of these objects (especially brooms) will “sweep away the family’s livelihood”, and is thus considered bad feng shui."